/ Wenn dieser Hang im Aufstieg gehalten hat, dann sollte er dies grundsätzlich auch in der Abfahrt tun. / Man steuert im Aufstieg nun nicht auf die Mitte des Gaibergferners zu, da man dort möglichen Eislawinen aus der marakanten Eiswand des oberen Gaisbergferners ausgesetzt ist. Deshalb hält man sich im Auftsieg ganz links, auch wenn sich hier der Gletscher auf teils mehr als 40° aufsteilt und die Spaltengefahr nicht zu unterschätzen ist. / Am steilen, spaltenreichen, orographisch rechten Rand des Gaisbergferners. / Wir haben nun auf dem Gaisbergferner genügend Abstand von den Sturzbahnen der Eislawinen. / Noch befinden wir uns im spaltenreichen Bereich des Gaisbergferners. 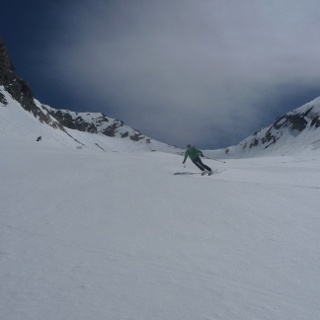 The ski tour to the Liebenerspitze-Hauptpipfel 3400m is an absolute highlight in the surroundings of Obergurgl. 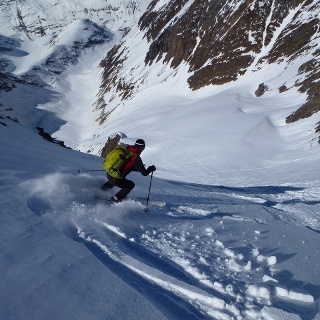 An absolute must for all ski touring lovers is the tour to the Liebenerspitze-Hauptpipfel. 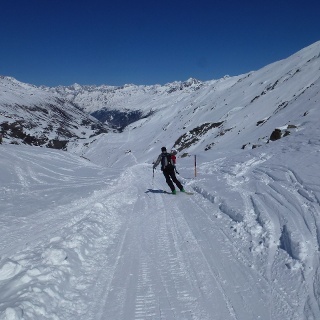 It is an absolute highlight in the surroundings of Obergurgl and offers everything a high alpine ski tour in the Ötztaler Alps can offer. The scenic scenery is as always overwhelming at the Ötztaler Hauptkamm, the descent belongs to the most beautiful what the tour region around Obergurgl has to offer. Die Liebenerspitze durch das Gaisbergtal bestiegen. 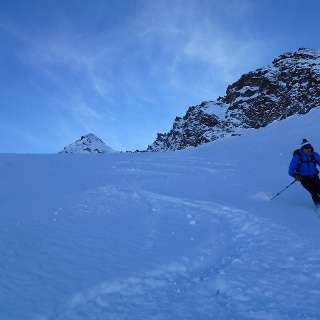 This has everything to offer in the ascent as well as in the descent, what a high alpine ski tour on the Ötztal main ridge has to offer. 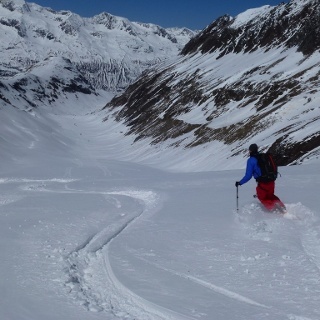 This includes a long ascent into a troy-like side valley the Gaiberg valley, with a glacier, which at its end is huge and in this case very clefty, the Gaisbergferner. In addition there is a huge and equally threatening ice break from the upper Gaisbergferner, which is an additional danger for the tour. This area is often marked by remnants of ice vigils and should therefore be bypassed in the ascent to the left, even if you are then in a clefty, more than 40 ° steep glacier zone. It is here just the lower evil to choose. In the descent, however, you can still be in the middle of the Gaisberg River, as soon as the threatened zone is quickly overcome. The most delicate ape awaits you at Pt. 3150m, where you have to change from the Gaisbergferner to the upper Gaisbergferner. The short, but more than 40 ° steep northern slope represents a last great danger moment. 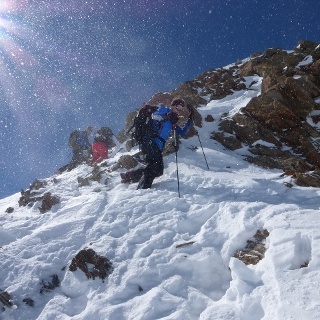 If one has overcome this, the 30 ° to 35 ° steep, but extensive summit slope should be hardly a problem. 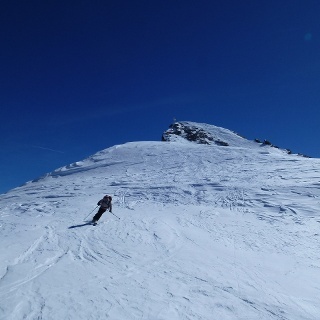 In addition, you can climb the summit up to the last few meters with skis. Rather an exception at the Ötztaler Hauptkamm. The last meters to the summit are then quite easy to cope with. The scenic scenery is as always overwhelming at the Ötztaler Hauptkamm, the descent belongs to the most beautiful what the tour region around Obergurgl has to offer. Starting in Obergurgl at the valley station of the Hohenmuhlbahn 1915m so to the summit to about 9.4 kilometers approximately 1500 height meters to be covered. If you use the Festkogelbahn as an ascent aid and drive to the valley entrance of the Gaisberg valley, the climb decreases to approx. 6.9 kilometers, or 1100 meters of altitude.